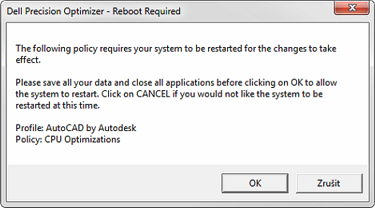 CAD Forum - AutoCAD slower after obeying the recommendation from DELL Precision Optimizer. DELL workstations with multi-core processors may invoke the "Dell Precision Optimizer" tool to recommend switching your AutoCAD installation to a dual-core and CPU Turbo mode. This, in most cases, can accelerate AutoCAD (with its mostly single-threaded computations) a little bit, however, when processing more complex drawings or performing more demanding computational operations, this constraint to just two kernels can cause a practical stop of background processes (such as printing, antivirus, e-mail, ERP) or a very poor responsiveness of the operating system. If you frequently perform demanding tasks in AutoCAD, ignore the DELL Optimizer recommendation and leave AutoCAD running on all available CPU kernels - this multi-kernel mode may be more suitable for you. Tip 4905: Using multiprocessing in AutoCAD. Tip 991: Will Inventor run faster on a multiprocessor PC? Atypical use of meshing for tiling a closed shape. « | » Double-click to edit raster images in DWG drawings.